If you are an over-the-air viewer with a TV antenna rather than cable or satellite and you can’t receive some of the local TV stations, you will need to perform a RESCAN on your TV for the new channel lineup. Press your remote control MENU button and find the SIGNAL or ANTENNA submenu, then select AIR (not CABLE), then AUTOPROGRAM or SCAN or RESCAN. Not all TVs have the same menu titles, so you may have to consult your TV set owner’s manual. Yeah, sorry you threw that away. Check out YouTube, maybe. 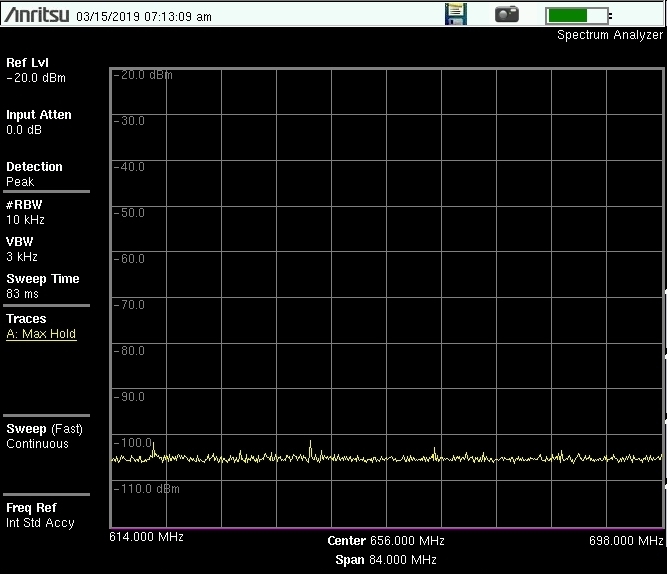 What was once UHF-TV channels 38 – 51, recorded by a spectrum analyzer in University City, San Diego, March 15, 2019 by Gary Stigall, Signal Wiz, Inc.
15 – XHTJB, public TV “Canal Once” (channel 11) moved from channel 46 in September 2018. The FCC website has this allocation placed in Ensenada, but they’re actually in Tijuana. 16 – KDTF, Entravision’s LATV outlet, moved from channel 51 on Mt. San Miguel on November 16, 2018 using their same broadband panel antenna. They were granted a Construction Permit on February 21, 2019 to allow them to stay on 16. 17 – KNSD, NBC Universal, moved permanently to channel 17 on March 14, 2019. They had installed a new Rohde & Schwarz transmitter and UHF Dielectric Pylon antenna installed by Wireless Infrastructure Services (“WIS”). 19 – KPBS, San Diego State University’s PBS outlet, had their antenna installed by WIS in 2018 and moved from channel 30 on March 26, 2019, taking over channel 19 from KSWB, who moved to 26. 20 – KZSD, a UHF outlet of Scripps, is up on Mt. San Miguel and broadcasting a repeat of their channel 10 lineup since November 2018. 21 – XHDTV Tecate, an Entravision-leased signal from Cerro Bola, Mexico near Tecate, moved from channel 47 on March 15, 2019. Manuel Rojo says they installed a new 32-panel antenna array. 24 – KBNT-CD on Mt. Soledad made the switch from channel 25 on March 14, 2019, at 6:00 AM, according to Chief Engineer Manuel Rojo. They have a new Harris transmitter and new antenna installed by Wireless Infrastructure Services at the KGTV transmitter site. 25 – KHAX-LD Vista has a CP to get exclusive use of channel 25. KBNT-CD switched from 25 to 24 on March 14. 26 – KSWB, Tribune’s Fox affiliate, had WIS install their Dielectric slot pylon antenna last fall. They moved from channel 19 on March 26. KVSD-LD from Mt. Woodson received a Silent STA on October 15, 2018. 27 – XHBJ Tijuana moved from 44 before November 30, 2018. 30 – KPBS moved from channel 30 to 19 on March 26, 2019. Tijuana will take over this channel in the future. 31 – KSDY-LD changed from 50 to 31 on February 8, and was granted their construction permit for channel 31 on February 21. KTCD-LP will share channel 31 from Mt. Woodson at 140 W ERP omni-directional. 35 – KVSD-LD has a CP to take over channel 35, but they filed with the FCC for a Silent STA in November 2018 and have yet to return to the air. 36 – KSKT-CA Mt. Woodson returned to air in early March, 2019 with shopping channels. 39 – KZSD-LP STA on Mt. San Miguel became KZSD-LD and moved to channel 20 in time for their November 30, 2019 T-Mobile takeover date. 40 – KNSD-TV moved to channel 17 on March 14, 2019. 46 – KTCD-LP Mt. Woodson, an Entravision signal, remains on channel 46 with a very low power analog signal. They will move to channel 31 digital as soon as possible. 47 – XHDTV went off-the-air March 14 and is expected to move to channel 21 soon. 50 – KSDY-LD moved to channel 31 on February 8, 2019. 51 – KDTF Mt. San Miguel moved to channel 16 using an STA before the November 30, 2018 T-Mobile deadline. Previous PostBonus March Chapter Meeting: SAS and Recent Digital Audio ProtocolsNext PostNo Chapter Meeting in April— See you at the NAB Show!